After completing my education I left the college, from that day onwards I wouldn't have to learn anymore; since the learning was a boring task for me. At that moment my intention was to do a job & earn money. But later the learning process doesn't seem to stop following me. When I started writing a blog, I realized that learning is a never-ending process & till now I have learned a lot from writing a blog. 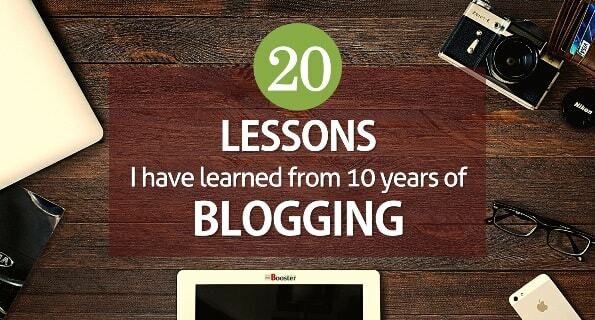 So here I am going to mention a few of those to share the blogging lessons & experience with you. Till now I have seen lots of blogging tips but here today I'm going to provide the blogging lessons that might help you in your blogging journey. And today I am going to share my experience of 10 years of blogging journey. I've had this blog for ten+ years. Till now I have learned a lot and still learning, including how to start a blog, how to create content, how to build and grow audience, and how to make money from blogging. It considered me a long time to find my score and here are 20+ lessons I learned during the blogging journey. If you see carefully, you will find that there is a broad range of bloggers blogging every day. It is full of competitors. If you are blogging as your hobby, you won't care too much about it. But If you want to set a career as a blogger, you have to face such a huge competition & it is almost impossible without self-improvement & regular update as there is something new coming out every day. Whenever we plan to do something new, we think that "am I able to do this?" can I really do this? It is obvious; because we believe about the future. We enlist the ideas & worry about what after this? It's just like driving a car at night & worrying that how can we reach the end destination as the car lights glow only a few meters from the car. But all of us know that as we go forward, the light also goes forward. Before starting a blog, I also was thinking like this. But I made my mind & started blogging and still amazed at how ideas start to flow. This is the most valuable thing I learned while writing a blog that doesn't worry about the future, get started & the ideas will come to you. Also read: Blogger vs WordPress Comparison - Which is Right for You? When we stuck at a point, we look for others to help us to go forward. But it hurts the self-dependant ability. So it's better to learn it from others that how they overcome such situations. How they find solutions to their problems. Learning from others doesn't mean to follow what they did. But just hear them for your reference & do it in your own way. The comments system in blogging has taught me this lesson. The way people & other bloggers post comments on a topic is just awesome. So the reply should be in comparison with that. Due to my shy nature, I didn't use to interact with people too much, so it was a bit challenging for me. But I learned it & now I communicate with ease. Before starting blogging, I had heard a lot about bloggers who were earning huge from it. So I made my mind to quit the job & start blogging. I started blogging believing in the sense that, I am gonna join all the leading bloggers now & make money as much I had heard about other bloggers income. But when I actually get started I realized that blogging is not an easy task. It gets a bit more time to settle in as a professional blogger. So I thought that it would be better to rejoin the job & start blogging as part-time work, the reason behind, I will have a backup for money unless & until I start to earn a desirable amount from blogging. This is the most important lesson that has taught me. So if you want to do something extra then don't ever try to quit your recent activity. Start it side by side & once you be sure about the income then you may think to leave it. Blogging is a lengthy process. You can't make your mark easily & quickly here. It's a time-consuming process & takes too much time to settle in. So you need to have much more patience to stick with it. Don't think about how much you are getting from it because nothing magical is going to happen. Keep writing on a regular basis. Don't get too much concerned about how much other bloggers are getting so you might get frustrated. Just do your job & let the rest happen. It's a very used to tagline you might heard; that a consistent performer always wins the race because he has a lot of work practice. A person gets known due to his consistency. A regular hammer can break through a big stone. Consistency is a primary tool to reach the goal. It allows you to stay updated; otherwise, you may get diverted from your actual subject/work. Reading increases knowledge & keeps updated as it helps to know new things come every day. The best way to get ideas is to read other articles. We can't consider writing without reading. Thoughts come to our mind because we have read it somewhere sometime. We imagine something in our mind before writing something & that is actually we listen to the thoughts through our mind. Meditation is nothing but listening to the inner sounds present in us. When we try to concentrate on those sounds we go deep into it. Similarly, when we start writing & keep it continuous, we go deeper into it allowing the thoughts to come to us rapidly. So writing is just like a meditation as for how much we go deeper into it, more writing thoughts and so the ideas will come to us. Suppose if you are watching a movie & continually pausing it at some intervals, you won't understand the meaning of the film & won't enjoy it. You won't get what the film is about & what previously was happening in the movie. It will cut the links in between. Like that; when you are doing work, give first preference to complete it & then look for the other tasks or think for a break. So you will be able to do it in the correct sequence. Instead of writing a series of blog posts in a short time if you write a few but quality blog posts then it would be a greater idea; because people use to see the quality first & then quantity. It's just like we prefer to buy a quality product in the market. You are supposed to write one blog post per day but still not getting the desired results that you want; then you may think to stop it & that is not one should want. A single well optimized & well-written blog post can bring a huge crowd. So the quality matters always. 12. Scheduling your blog posts. Schedule your posts according to the trend. Look at what people are interested in? What are their expectations? What will they want to know ahead of the next situation/season before it starts? & try to publish your blog posts ahead of that trend. It's your need to post such content that your users can make use of it. e.g. If you publish a review blog post about a product ahead of a festive season, then it may get massive traffic to your blog post. So enlist your blog ideas & try to categorize them according to the trends. Keep it ready to post & publish ahead of that related season/trend. 13. Note down the ideas whenever they come. When I started writing a blog, I was quite unable to get the required ideas on time when I sit to write & the interesting thing I found that when I was getting off the blog or doing something else with my free mind or talking with somebody, I used to get the useful ideas. Since then I started to note down the ideas in my notepad whenever I got them in my mind. Also, I began to note down the information I receive from everywhere so as to make use of it. 14. Social Media is Godfather. If you want to admit a statement & share something to the people around the globe so that they can get aware of something, then nothing a better source than social media like Facebook, Twitter, Instagram, etc. People use to spend hours on social media. Social Media is a Godfather. It can get you up & down as well. It can give fame & shame as well. People crowd here most of the time. Therefore the best option is to share your blog posts on social media to let the crowd visit & read it. With social media you can know what type of information people like the most so that you can find the topic to create, which will be of users interest. But the most important thing is, always stay engaged with your users. Just keep in mind that; the best motivation comes from the blamers & haters. The blamers are just like insects that enter the body to spread disease. However, that gives a reason for the antibodies to get active & fight against them which is a good sign for the body as the immunity improves. Like that whenever you do something new & bigger, the stupid criticisms start to come from their mouth which can hit your mind making you emotionally distress & you may get distracted. But this is the best time to get motivated as the blamers are the valid source of motivation, but only when you think like that, otherwise your egoistic nature may make this difficult for you. This seems to happen a lot with one who wants to go above the limit. They don't want to see you at the top. So whenever situations like this come to you, be more motivated. A story told with emotions touches everyone's heart, a movie scripted with emotions wins everyone's heart, a blog written with emotions brings more traffic. Everything done with emotions creates more chances to be perfect & get liked by everyone. When you do something with emotions you don't have to explain more; feelings says it all just like telling your real story. It keeps the audience engaged until the end. Sometimes the audience looks for still more. Emotions let the audience feel like it's their own experience. Emotions come from heart & heart is supposed to be a center of the body controlling all the functions. It's all about to let the people feel emotions & once you succeed in it, then the mouse will be in your hand you can move it anywhere on the screen. In my post about advantages & disadvantages of blogging, I have mentioned the disadvantages of blogging that you fill alone. If you don't have a co-worker to work with you, you will feel lonely. To overcome this, I started to give some time for myself, my family & friends that help to decrease the pressure. I used to attend every possible function & enjoy my life with everybody along with doing my work. Now I am maintaining a proper balance between social & professional life. No one is perfect in every aspect. If I have writing skill, someone may have a photographic talent; someone likes teaching. Every single person has different skills & if we merge them all together, obviously something will happen extraordinarily. Working with a team is far more better than working singly. It creates lots of ideas & ways to work with. You can have a group discussion & decide what everybody should do. It increases the hours of working & also improves the quality of work. As we know writing requires reading & reading gives you complete knowledge. Once you have a piece of complete knowledge, you will be called as an expert, a specialist. And yes you started to behave like an expert. Think like an expert, change your mind to work as an expert. Don't over-share your ideas with others except for your co-workers so that they can make use of it before you do. Blogging doesn't mean writing only a text; it requires some extra skills like you should add some visuals for that you need to know photography. You should also be aware of videography to add videos. The blogs are optimized for the search engine so you should learn presentation skill. Along with this, you have to edit it, format it & publish it. So on-&-on you should possess multiple skills. And blogging has taught me all this. It's just ten years till now, and I am learning & gaining a lot from writing content and by choosing the blogging field over the last decade. No matter, I have learned many lessons and enjoyed my blogging journey; I will continue to learn more from coming years. And from this post, I believe you have gained some insights from my experience and hope this will help you to develop your blog and grow your blogging life. However, if you have something different experience with your blogging days, then share it with us via comment sections shown below. I would like to read and get from your thoughts.